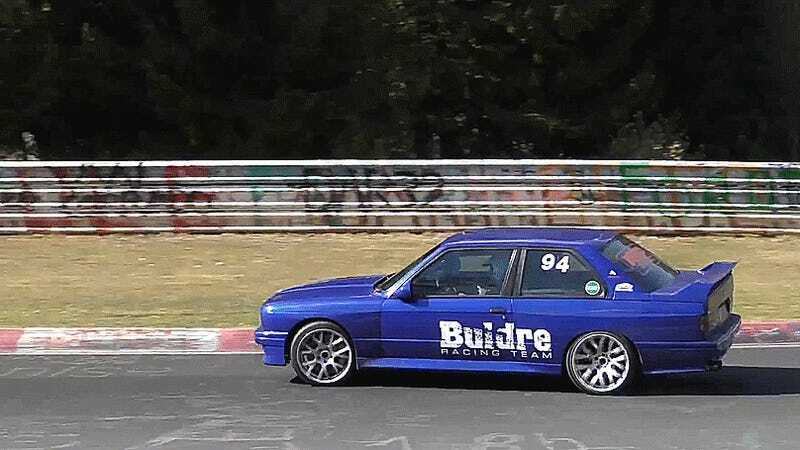 Did you need a screaming blurple BMW E30 M3 with a ridiculously boosted 2JZ-GTE engine from a Supra in your life? Well, you do now. Here it is getting deliciously sideways on the Nürburgring Nordschleife. However, because he did this during a Touristenfahrten session where the ‘Ring opens up to the public, he got yanked off the ‘Ring because no one expects you to drift there during those days. Remember, folks: drift responsibly, and make sure you’re doing it in places where it’s fine to get sideways. It’s still a mega-cool car, though. Owner Vidar Jødahl added a long list of mods to this monster according to the YouTube description, including a full roll cage, Sellholm MPG sequential transmission, Garrett GTX4294R turbocharger, Pectel T6 ECU, Powerhouse Racing rods and pistons, a ported head, Sellholm coilovers and 18-inch Compomotive MO wheels. When running on 42 psi of boost (! ), it’s all good for 1,305 hp at the flywheel, 1,138 HP at the wheels and 996 lb-ft of torque. Holy crapballs.